A fascinating memoir of World War II by one of FDR’s inner circle—a man who experienced the war from both the White House and the bridge of a warship. 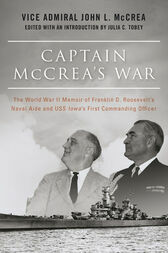 Captain McCrea’s War chronicles Vice Adm. John L. McCrea’s experiences in WWII—working with President Franklin D. Roosevelt on difficult and unusual assignments, associating with royalty and world-famous political and military leaders, and commanding the USS Iowa and a task force in the Pacific. McCrea served as a naval aide and set up the White House Map Room (now known as the Situation Room) and Shangri-La (now called Camp David). He supplied material for the president’s fireside chats, helped arrange the Casablanca Conference, and worked with such prominent leaders as Winston S. Churchill and Gen. Douglas MacArthur. Despite his important work for the president, McCrea yearned for sea duty, and was given command of the country’s newest and largest battleship, the USS Iowa. Vice Admiral John L. McCrea graduated from the US Naval Academy in 1915 and saw active duty in both World War I and World War II. He served as naval aide to FDR and was the first commander of the USS Iowa. After WWII he served as deputy commander in chief of the Pacific Fleet. He died in 1990, at the age of 98, in Needham, Massachusetts. Julia C. Tobey worked as an editor, writer, and researcher before earning a law degree. Her stepfather was Vice Admiral John L. McCrea. After retiring from her law practice, she edited McCrea’s reminiscences to create this memoir. Tobey lives in New York City.